UUC * TECH TIP: What causes gearbox rattle / rollover noise? What actually causes "lightweight flywheel noise" / "gear rattle" / "gear lash noise"
Enthusiasts considering a lightweight flywheel are often warned of "lightweight flywheel noise", more correctly called "gear rattle" or "gear lash noise". In making modifications to any car, there may at times be certain compromises in other areas of the car's behavior. Some may be completely acceptable, others may not. In a luxury-minded enthusiasts car like a BMW, owners are concerned about new or excessive sounds or rattles. A piston engine's power delivery is not seamless like an electric motor. A piston engine makes pulses of power very rapidly. How often? In the M3, (3 X rpm) per minute. Now realize that any drivetrain component (transmission or differential) has a certain amount of looseness or slack in it - it must, or being too tight would create a lot more friction. So when the power pulse engages the transmission, it is causing the rotational power going through the unit to take up that slack. This effectively causes components to touch that were not pressed together a moment before. Between each power pulse, those components de-couple. Press any two hard objects together, whether it be a tea cup and saucer or a hammer and nail, and you notice that noise is made. Repeat the contact-release-contact cycle quickly and it makes a staccato sound - a rattle. Since around 1993, most of the larger-engine BMWs (6 cylinder and V8) went from solid single-mass flywheels to dual-mass flywheels. A dual-mass (or "twin mass") flywheel is effectively two flywheels in one, connected to each other by a coupling that allows the two flywheels to rotate relative to each other in a range up to 15 degrees, but with a small amount of resistance to this movement. This movement and the inertia/resistance of the mechanism and mass of the flywheels, therefore cushioning the power pulse variation that can cause gear rattle. 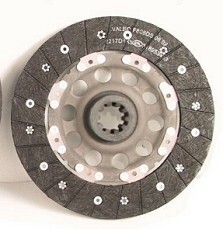 Dual-mass flywheels use a simple solid-center clutch disk. The original dual-mass flywheel does one thing very well - exhibits inertia, the resistance to changing it's state of motion. It is more difficult to change the speed of the dual-mass flywheel, whether accelerating it or slowing it down... that means besides inhibiting engine acceleration to some degree, it also inhibits the deceleration that occurs between every power pulse. The power pulse transition is smoother, therefore no rattle. A single-mass flywheel is the same sort of design as a solid aluminum lightweight flywheel: a rigid disk of metal, either aluminum or steel. In the OE applications, these flywheels are equipped with a sprung-hub clutch. 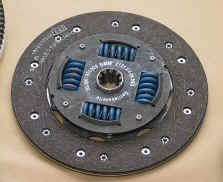 The sprung-hub clutch "splits thte difference" between the these situations. The friction material (the disk itself) is not "hard coupled" to the hub, but has a springy nature to the assembly. It has a suspension, the springs you see around the hub. What this accomplishes is letting the power pulse couple the transmission's internal parts softly, and then de-couple softly. ("Softly" being a relative term here, it is just a few millimeters of travel, nothing that can be felt.) The net result is the difference between banging two pieces together and gently placing them together. This clutch design has a center section that is separate from the outer friction area, with a flexible coupling mechanism that uses springs to cushion the power pulse variations. Sounds very similar to the dual-mass flywheel mechanism discussed earlier for a very good reason; the idea is exactly the same, but moves the power pulse variation absorption mechanism to the clutch disk itself. The issue with gear rattle is that conventional lightweight flywheels retain the car's original solid-hub clutch disk. First, the lightened flywheel has less mass to damp the power pulse variations. Second, there is no mechanism within the solid-hub clutch disk to absorb the power pulse variations. The result is that a conventional lightweight flywheel with solid-hub clutch may create a noticeable amount of rattle. There is simply no cushioning action at all. Note that this gear rattle only occurs at idle, in neutral, with the clutch let out. It is not heard at any other time. Above idle (even just a couple hundred rpm) and the increased frequency of power pulses outpaces the speed at which the components couple/de-couple, therefore no rattle whatsoever. So how to have the best of both worlds? Simply use the correct style of clutch disk for the flywheel in use. If using a lightweight single-mass flywheel, the answer is to use a sprung-hub center clutch disk. The sprung-hub center setup damps out the majority of the power pulse variations, resulting in little to no rattle. Due to the frequency of the power pulses, slowing down the engine slightly more at idle by turning on the A/C and loading up the alternator with headlights and other electrical draw may increase the amount of residual rattle. A change to a slightly heavier grade of transmission fluid (UUC recommends a specific mix of transmission fluids, 1 bottle Redline 75W-140NS and 1 bottle Redline D4 ATF) will eliminate it entirely in some cars, or at least reduce the remaining rattle a subjective 90%. Some cars may always have a certain amount of rattle. 1999-2005 E46 3-series (not M3 or 330 6-speed) and 1996-2003 E39 5-series (all 6-cylinder): specific Stage 2 flywheel with 330/530 pressure plate and sprung-hub M5 clutch disk or UUC's own high-performance sprung hub clutch kit (standard 330i 5-speed clutch kit can be used but is not sprung-hub). 2001-2004 E46 M3: specific Stage2 flywheel and UUC's own high-performance sprung hub clutch kit (standard M3 clutch kit can be used but is not sprung-hub). 2000-2003 E39 M5: Ultimate V8 flywheel and clutch conversion featuring larger-area sprung-hub clutch disk for extended-life duty cycle. Note that the sprung-hub design is usually very successful, but not an absolute guarantee of rattle-free operation. Variables such as transmission wear, engine smoothness, condition of engine and transmission mounts, drag from other accessories, and exact idle speed can cause significant variation. On these message boards, we tend to hear from the "worst case" users, simply because they are not getting the ideal results and are looking for remedy. In every single one of these worst-case situations, we have been able to improve their results dramatically with the aforementioned change in transmission fluid (1 bottle Redline 75W-140NS and 1 bottle Redline D4 ATF) which acts as an additional internal cushion while maintaining smooth operation even when cold. Additional improvements can be found by making sure the car is in good tune - check the sparkplugs, injectors, and air filter. A state of good tune makes the power pulses more even or more frequent (due to a slight increase in idle to the correct rpm), which smooths out the power delivery.